20:45 - The ex-housemates, Miss P, Elikem, Natasha, Leonel, Uti, Luclay, Feza, Denzel, Sulu and Vimbai are in the house and the drama is already heating up! 19:34 - Macky2 receives yet another gift for winning last week's star meter as the funniest housemate. 19:03 - Today's diary sessions end with JJ, he hopes to meet Samantha outside the house and say everything that he wants to say to her. 18:46 - Sheillah is happy to be the Head of House especially at this point when ex-housemates are going to join them. That she can't wait for them to see who is boss, she says this is her biggest highlight so far. 18:35 - Idris talks about how he was compltely broken to see Samantha leave but that he has now pulled himself together to be ready for the "new" housemates are going to join them. 18:29 - Butterphly says Figgie was really awesome because they needed a wake-up call and she mentioned some important things. She says she cried for the first time during evictions last night because Samantha was cool and Mr. 265 was close to her. About the ex-housemates, she emphasises that she went through a lot to get on the show so she won't let anyone steal her moment. 18:18 - M'am Bea says she is not intimidated by the housemates coming in and she is going to step-up her game. 18:01 - Goitse in the diary room, she is grateful to Africa for saving her. She says she felt lonely on Saturday but Figgie came and made it fun though some of her comments were a bit rude. She talks about how she was shocked by last night's evictions but says she's ready for anything that comes her way. 17:50 - Juggling pro Stefan leaves the house, the housemates continue practicing what he has taught them. 17:44 - Nhlanhla tells Biggie that they're shaken by the coming of "potential new housemates" because some of them like Uti have played the game multiple times and already have a following all over Africa. That for now he's just aching to see his message from home and get motivated. 17:32 - Ellah says they're hoping the ex-housemates are fake because it's been a journey and for others to just come in to also play the game at this stage is a bit unfair. 17:26 - Trezagah welcomes Biggie back and says he missed him so much. He mentions that his team won the extravaganza but unfortunately there was no immunity this time. He says he learnt so much from Figgie because of her criticism. He also tells Biggie that the coming of the ex-housemates is a big challenge to them. 17:14 - Sipe says she felt really bad when they lost last week's wager but she was happy when Figgie came and corrected them. She feels people were relaxed with the extravaganza because there was no immunity to be won. 16:40 - Its task time and Stefan, a circus performer is in the house teaching the housemates how to juggle. 16:05 - Macky2 talks about Figgie with Biggie, he says was happy with her criticisms especially on cleanliness and also during the extravaganza. 16:02 - Tayo is first in today's diary sessions. With the coming of the former housemates tonight, he feels that he will have people in the house that he can get along with better. He also feels that people are now showing their true colours. 15:40 - Idris joins Goitse in the kitchen to help her cook lunch. 15:12 - M'am Bea discusses artistry with JJ and Ellah, respecting each others art. She discusses working with the ex-housemates. 14:51 - The housemates play a word association game by category. "Nike." "I said Nike." "I said it better." 14:10 - Sheillah lays down the house rules for this week. She's serious with her work and wants complete cleanliness. 13:50 - Housemates play around with words ending with "ity", it's all fun as Idris comes up with words like "Goitsity" and "Buttity". 13:28 - Sheillah calls upon fellow housemates to respect each other during her Head of House reign. 13:18 - Straight to work, Sheillah reads out this week's task to the rest. It's Circus, Magic and Wonder. They wager 100% according to majority rule. 13:12 - Sheillah is announced the new Head of House for this week. Outgoing HoH Sipe hands-over the medallion to her. 13:05 - The HoH task is moved indoors to the living room as it's raining heavily outside. Butterphly, Trezagah and Sheillah are the participants. 11:52 - Sipe calls all housemates to the lounge and reads out the qualifier task, it's a puzzle game of chance and only three housemates will qualify for the final round. 11:48 - HoH Sipe is called to the diary room. 11:40 - As the gossip session heats up in the kitchen, Tayo takes a long nap. 11:30 - The girls: Ellah, M'am and Goitse gossip about Tayo, Ma’m Bea says he doesn't like the "Hotshot" title. 11:24 - Ellah shares with M'am Bea about what’s she discussed with Tayo a while ago. Is that gossiping or sharing? 11:19 - The store room is now open for rendezvous, says Biggie. 10:50 - Ellah tells Tayo to always approach her in case he's not sure about his feelings. 10:36 - Ellah gives her side of the story, emphasizing that her beauty queen crown doesn't mean she's the most beautiful woman in the world but she's still surviving and okay with the way she is. Tayo then mentions that he hates negative energy. 10:20 - Tayo opens up to Ellah saying the way she and other housemates reacted towards Uti's anticipated entry was a "blow" towards him because that doesn't make him less of a man. 10:16 - Macky2 is having his breakfast. Idris says he's loving the "new kitchen", Macky2 says it's courtesy of M'am Bea who woke up early and cleaned the area. 10:07 - JJ says he wishes there's an HoH task so that the winner wins immunity. 10:06 - JJ and Idris treat Ellah like the queen that she is as they fry her eggs. 10:05 - Biggie announces that hot water is no longer available. 10:03 - Idris and Ellah play in the kitchen, they ask Trezagah to join them and he runs away. 10:01 - JJ fries eggs as Idris looks on. 10:00 - JJ and Ellah won't stop hugging in the kitchen, JJ to Idris: "I'm hugging my friend." 09:55 - Breakfast is brewing in the kitchen. 09:25 - JJ, Nhlanhla and Idris chat up a storm on the dining table. 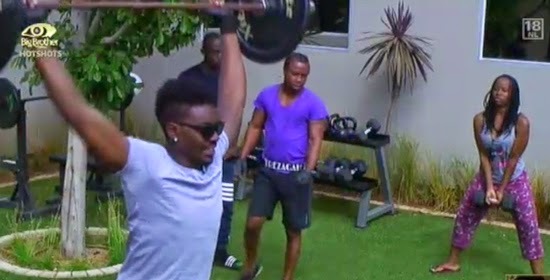 09:04 - Tayo, Goitse, Macky2 and Trezagah workout with the weights. 08:50 - RJ's session ends with M'am Bea showing some vocal abilities. 08:45 - Sheillah and Nhlanhla get to singing with RJ guiding them all through. 08:23 - RJ tells Trezagah to get some water because his voice is bad this morning. 08:08 - RJ takes housemates through some breathing exercises. 08:00 - One by one housemates join RJ in the lounge. 07:52 - Vocal coach RJ Benjamin is in the house. 07:45 - Biggie's weird alarms go off to awaken the housemates. 07:30 - M'am Bea is already awake, she's washing the dishes and cleaning the kitchen area. Tayo has issues my God,please leave ellah and mam be.I wish you knew how those guys care about you. Ellah was sharing with mam be cos they stood out for him last week.I dont blame her,wouldn't you be shocked when you have no issues with someone and you genuinely care about them. And they have issues with you.come on,Tayo thinks every one hates him.ellah and mam be all the way. Tayo is in the group that lost the extravaganza now there is no immunity everybody is up for eviction ......how interesting but we are watching we see all these tricks. But then Mam bea is equally playing game and lm sorry to say this with her own brother. She should realise that some of those housemates are using her to get at Tayo. If you listen to their convo yesterday, you'll realise that they were somehow attacking Tayo but in a subtle way. Sheilla initiated it and Mam bea took it up which annoyed Tayo who believes Mam bea is the only person he can trust amongst the other housemates. Common guys spear him a little. If you were in his shoes, you'd do same.